It’s a New Year and top-producing Orange County realtor Cheryl Marquis is not wasting any time finding fabulous new homes for her Orange County buyers! You probably read our blog post from the end of last year (if not, you can read it here), which shared that Cheryl and The Marquis Group listed and sold SEVENTEEN homes in Orange County, much to the excitement of her clients, the sellers. In a few instances, such as with this gorgeous Irvine Cove gem, Cheryl represented both the seller and the buyer. In her most recent transaction, Cheryl brought her long-time clients to the ultra-exclusive community of Cyprus Shore. There are a handful of these beautiful ocean front neighborhoods in South Orange County, and Cyprus Shore satisfies even the most-discerning eye. 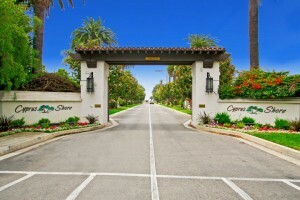 Cyprus Shore is San Clemente’s premiere ocean front gated community. With approximately 123 custom luxury homes ranging in size from approximately 1,900 to 4,300 square feet, it is elegant Orange County living defined. With private beach access that overlooks world-famous Trestles, Cyprus Shore is a safe, close-knit playground for children of all ages! The Community Pool, Spa, Tennis Courts, and Tropical Park Setting contribute to this idyllic setting. Cheryl viewed the Cyprus Shore property her clients ended up buying months before they decided to purchase their dream home. Familiar with her long-time clients needs and preferences, she knew immediately that this was the home for them. While it took a little longer for her clients to make this big decision (they still loved the home in Laguna Niguel that she had found for them in years before! ), they later told her that they, too, knew this gorgeous beach house had to be theirs the moment they laid eyes on it. Cheryl works closely with her clients, both buyers and sellers, to understand their expectations and preferences. As a home owner in Orange County herself, she understands that buying and or selling a home is often the biggest decision a family or individual has to make and, along with the help of her experienced team, guides her clients through the process.